As both a business owner and a frequent flyer points lover, I hate seeing money leave my business bank account to pay a bill and not earn any points in the process. The same goes for paying an expense with a credit card only to find that it earns no or reduced points – as often occurs with large payments to the tax office, government bodies, insurance companies and telco firms. So I was very pleased earlier this year when I found a way around these problems. I’ve been using the payment service B2Bpay to earn full credit card rewards points on things like tax and superannuation payments, as well as paying suppliers who don’t accept credit cards themselves. I also earn additional Qantas Points along the way. I now amass a huge number of points this way, and I turn those points into flights – in business class, of course! This shaves thousands of dollars off the cost of work trips and holidays, and I always get to fly in comfort and style. In this article I’ll describe how B2Bpay works so you can decide if it’s right for you. Here’s a 3-minute video overview of how B2Bpay works, and then I’ll dig into the details. B2Bpay is a secure online payment portal through which you can pay all business expenses with a credit card and earn full points. You can use a Visa, Mastercard, American Express or Diners Club card. B2Bpay charges your card and deposits funds to your supplier / biller by electronic funds transfer (EFT) or BPAY within 3 business days. Therefore, your supplier doesn’t need to directly accept card payments. Since your card issuer treats the B2Bpay transaction as a purchase (not a cash advance), it earns full points, like other card purchases. 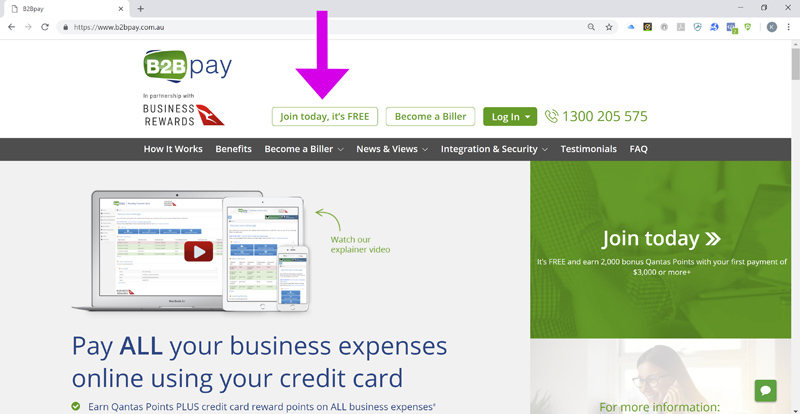 Thanks to B2Bpay’s partnership with Qantas Business Rewards (which is Qantas’ loyalty program for SMEs), your business also earns 1 Qantas Point for every $100 paid through B2Bpay, and up to 3 Qantas Points for every $1.50 paid with B2Bpay’s network of Bonus Billers. If you’re not yet a Qantas Business Rewards member, as a B2Bpay customer you can join for free here, saving $89.50. There are many other opportunities for your business to earn Qantas Points through Qantas Business Rewards – it’s a very handy program. B2Bpay is very easy to set up and use. To get set up, simply go to B2Bpay’s website and click on the “Join today, it’s free” button at the top of the page. It only takes a minute to fill in your details and complete the sign-up process. 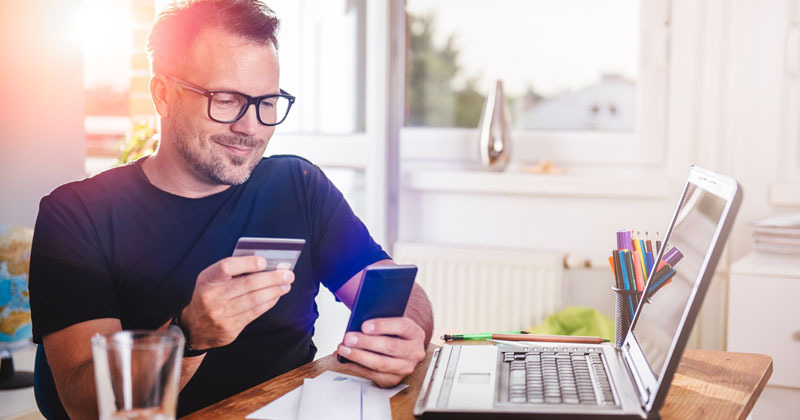 Once you’re logged in, you can add the details of your credit cards and billers, and make a one-off payment, future payments or set up regular payments. All the information you enter is saved securely in B2Bpay’s PCI compliant system, so you won’t need to input the same card or biller details the next time you want to make a payment: you’ll be able to do so with just a few clicks from your account homepage. One of the main benefits is (obviously) raking in those sought-after credit card rewards points and Qantas Points! B2Bpay helps you earn points faster so you can redeem them for high-value rewards, like flights. I find it easy to earn enough points to cover work trips and holidays in business class. For example, a return business class flight from my home town of Melbourne to Hong Kong costs 120,000 Qantas Points (plus taxes and fees). 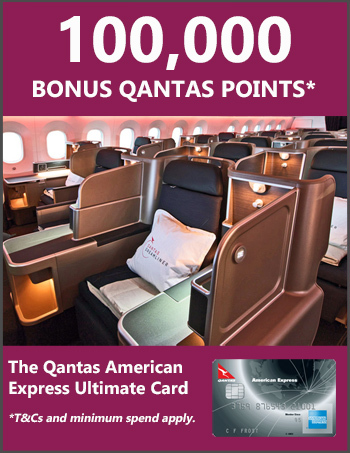 Since the Amex card I use earns 1.5 Qantas Points per dollar spent, I need to make around $80,000 of payments to earn 120,000 points. That’s not hard to do with tax payments, super, supplier invoices and the like. Other benefits of using B2Bpay include improved cash-flow (since you have up to 55 days to pay off your card without incurring interest) and saving time (since you can pay multiple suppliers through B2Bpay with just a few clicks). You can read more about the benefits on B2Bpay’s website, here. B2Bpay charges 1.2% plus GST for a standard Visa or Mastercard, 1.55% plus GST for premium / corporate Visa or Mastercard, and 2.4% plus GST for American Express and Diners Club. Factoring in this cost, you’ll get the best deal by using a high points-earning credit card. Take my example of flying to Hong Kong in business class above: my Amex card earns 1.5 Qantas Points per dollar, so I need to put through $80,000 of spend to earn the 120,000 points required for this booking. For this spend, B2Bpay charges $1920 plus GST, and in my case that’s tax deductible (chat with your accountant). Even taking into account the taxes and fees I’d pay with this points booking, it still works out to be around half the cost of purchasing a business class fare with cash on that route. I consider that to be a good deal! I’ve been using B2Bpay for almost a year now, and it’s become my primary method for paying tax, super and other bills where I want to maximise the points earned. These points are funding many work and holiday flights, saving me thousands of dollars on airfares and allowing me to travel comfortably at the pointy end of the plane every time. I’ve found the B2Bpay payment portal very easy to use, with funds always delivered to my billers within 3 business days, and you can see all the payment details and dates within the portal. If you’re interested in trying out B2Bpay for your business, click the link below to go to B2Bpay’s website. To visit B2Bpay, click here. This article is sponsored by B2Bpay. The author’s opinions are genuinely held. Thanks for sharing this article. I think that B2B is a great tool that can be use and can lessen the hussle in paying bill. I like this because I don’t have to travel far away just to pay my bill. This tool is really helpful. I totally agree with what you said. B2Bpay is a great tool for paying bills. I find it very helpful for me and my small business too. I’ve been using this tool for over a year now and I definitely like it. This tool is definitely great for small business owners. The video definitely helps.Thanks for sharing this. I think that B2B is a great tool in running a business. I can’t recall exactly how the linking process worked when I signed up but I’m sure it was very straightforward 🙂 If you don’t have a QBR account yet, set that up first – though it sounds like you’re already aware that your ABN is your QBR member number. I also used B2Bpay to pay tax. This is definitely great to use. Nice article. My friend who has a business is using B2Bpay also. He always recommended this to his friends and to me. I can see that is really reliable and I’m planning to get B2Bpay also.